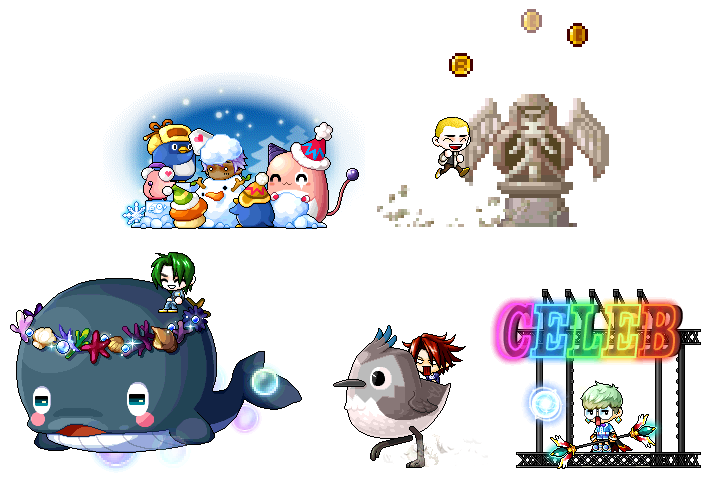 [Notice] [Updated March 26] Retro World Events! Thread: [Notice] [Updated March 26] Retro World Events! Blast back to the 8-bit era with these Retro World Events! Characters Lv. 61 and up can participate by opening the*‘[Event] Retro World Opens!’ quest through the 8-bit ‘R’ icon within the star notifier or though the Retro World Console, which can be found in Henesys, Leafre, or Nameless Town. Participate in these events to earn*Retro Points. For every 100 Retro Points, you’ll automatically receive 1 Retro Coin, which can be used*in the*Retro World Coin Shop! (You can earn up to 20,000 Retro Points every day, and 40,000 Retro Points every Sunday). Help Game Master Jun promote the opening of Retro World! Characters Lv. 61 and above can participate by accepting the quest*‘[Retro World] Promote the Game!’ through the 8-bit ‘R’ icon within the star event notifier on the left side of the screen. You can then*hunt monsters near your level (20 levels below and 20 levels above) to earn Retro World Promo Coupons! You can earn a max of 40 coupons daily. *For every Retro World Promotion Coupon, you can earn 500 Retro Points. Get your platforming on to train for the Demon King's Tower in*Mercenary's Jump Training! Talk to NPC Gunnolf in Retro World map and accept the ‘[Retro World] Mercenary’s Jump Training’ quest to enter the Jump Training Area. *Your goal is to*jump your way from one side of the training ground to the other*before the time runs out in 60 seconds. You can also earn Retro Coins by collecting them as as you hop across the map! Once*you have obtained 20,000 Retro Points from the Mercenary’s Jump Training Area, you'll earn the Retro World Champion Jumper title! Retro World Champion Jumper: Title. Untradeable. Grants STR/DEX/INT/LUK +5, Jump +15. Leap around and dodge Magician's flames to train for the Demon King's Tower in*Magician's Dodge Training! *Complete the ‘[Retro World] Magician’s Dodge Training’ quest through NPC Photios in Retro World map to enter the Magician’s Dodge Training Area. *The goal of this game is to successfully dodge all the fireballs for 2 minutes. You can also collect any*Retro Coins that you find in the area. Once you've been hit by 5 fireballs, you'll be sent back to Retro World. * You can enter the*Magician’s Flame Dodge Training Area twice a day per world. If you earn 20,000 points from the Magician’s Dodge Training Area, you'll receive the*Retro World Champion Dodger title! Retro World Champion Dodger: Title. Untradeable. Grants ATT/Magic ATT +2, Movement Speed +15. Once you have completed your training in the*‘Retro World Champion Dodger’ and ‘Retro World Champion Jumper’ quests (by earning the Retro World Champion Dodger and Retro World Champion Jumper titles), you can finally enter the Demon King’s Tower. *Accept ‘[Retro World] Eliminate the Demon King’ quest to enter the Demon King’s Tower. In the tower, you will have to complete 4 stages that consist of 5 floors each in order to face the Demon King. You'll have to use your jumping and evading skills that you learned from Magician and Mercenary to reach the 21st floor where the Demon King awaits. If you fail the stage, you'll have to start over. *You can earn Retro Coins by eliminating the monsters and opening the treasure chests in the Tower. You can obtain Retro Hero title when you clear the 21st floor. The durational stats on the title will expire after 30 days. Retro Hero: Title. Grants default stats STR/DEX/INT/LUK +5. MaxHP/MaxMP + 500. Grants durational stats STR/DEX/INT/LUK +15, MaxHP/MaxMP + 500, ATT/Magic ATT +10, +15\% damage when attacking bosses. Retro World Purple Potion: Use from Lv. 100 - 199 characters to increase your level by 1. Retro World Orange Potion: Use from Lv. 100 - 179 characters to increase your level by 1. Retro World Red Potion: Use from Lv. 100 - 159 characters to increase your level by 1. All potions’ purchase limit resets weekly and can be traded within account. Glitches have escaped from Retro World into Maple World and you need to hunt them down! Accept the*‘[Retro World] Eliminate Bug Monsters!’ quest and hunt bug monsters that appear in the map while you hunt monsters near your level (20 levels below and 20 levels above). Each day you can defeat 40 bug monsters to earn a*Retro World Coin Box (1-day duration) that contains Retro World Coins (x30)! Earn extra EXP by hunting in the*Retro Reach*map! Characters Lv. 100 and up can participate by talking*to NPC Photios in the Retro World map and spending 5 Retro Coins to summon 500 monsters to hunt. You can talk to NPC Photios to change the level and type of monster that has been summoned. You will obtain*120\% Bonus EXP* from hunting monsters in the Retro Reach map! Up to 10 players can be visible at once, and all buffs are shared among the players in the map. Pivotal Adventure Ring: 1500 Retro Coins. Limited quantity: 1. Tradeable once within account. Synergy Ring Coupon: 800 Retro Coins. Limited quantity: 1. Untradeable, 10-day duration. Synergy Ring Cube: 30 Retro Coins. Limited quantity: 5 daily. Untradeable, 10-day duration. Can only use on Synergy Ring. Eternal Rebirth Flame: 200 Retro Coins. Limited quantity: 20. Untradeable, 10-day duration. Powerful Rebirth Flame: 80 Retro Coins. Limited quantity: 10. Untradeable, 10-day duration. Epic Potential Scroll 50\%: *100 Retro Coins. Limited quantity: 3. Untradeable, 10-day duration. Special Medal of Honor: 70 Retro Coins. Limited quantity: 5. Untradeable, 10-day duration. SP Reset Scroll: 50 Retro Coins. Limited quantity: 1. Untradeable, 10-day duration. AP Reset Scroll: 50 Retro Coins. Limited quantity: 1. Untradeable, 10-day duration. Occult Cube: 5 Retro Coins. Limited quantity: 10. Untradeable, 10-day duration. Gold Potential Stamp: 20 Retro Coins. Limited quantity: 5. Untradeable, 10-day duration. Nodestone: 50 Retro Coins. Limited quantity: 10 weekly. Untradeable, 10-day duration. Arcane Symbol Selector Coupon: 50 Retro Coins. Limited quantity: 20 weekly. Untradeable, 10-day duration. Damage Skin Extraction Coupon: 1500 Retro Coins. Limited quantity: 3. Untradeable. 8-Bit Damage Skin: 350 Retro Coins. Limited quantity: 1. Untradeable, 10-day duration. Remnant of the Goddess Damage Skin: 200 Retro Coins. Limited quantity: 1. Tradeable within account, 10-day duration. Gilded Damage Skin: 200 Retro Coins. Limited quantity: 1. Tradeable within account, 10-day duration. Avaracia’s Blessing: 400 Retro Coins. Limited quantity: 1. Untradeable. Maple Celebrity Chair: 700 Retro Coins. Limited quantity: 1. Untradeable. I, Snowman Chair: 300 Retro Coins. Limited quantity: 1. Untradeable. Permanent Flying Whale Mount Coupon: 400 Retro Coins. Limited quantity: 1. Untradeable, 10-day duration. Permanent Baby Snipe Mount Coupon: 400 Retro Coins. Limited quantity: 1. Untradeable, 10-day duration. Trait Boost Potion: 300 Retro Coins. Limited quantity: 1. Untradeable, 10-day duration. Job Advancement Coin: 300 Retro Coins. Limited quantity: 1. Tradeable within account, 10-day duration. Character Slot Expansion Coupon: 200 Retro Coins. Limited quantity: 1. Untradeable, 10-day duration. Hyper Teleport Rock Coupon (1 Day): 15 Retro Coins. Limited quantity: 1 daily. Untradeable, 10-day duration. Mastery Book 20: 10 Retro Coins. Limited quantity: 10. Tradeable. Mastery Book 30: 20 Retro Coins. Limited quantity: 10. Tradeable. Power Elixir Coupon (x100): 5 Retro Coins. Limited quantity: 5 daily. Untradeable, 10-day duration. Pollo and Fritto Entry Ticket: 20 Retro Coins. Limited quantity: 1 daily. Untradeable, 1-day duration. All Sylph Stones and Crystals’ purchase limit resets daily. They are all sold in non-Reboot worlds only. [Updated March 26]*The daily limit of monsters that can be summoned in the Retro Reach event was listed incorrectly. This has been fixed.